Think you can drive 18 miles in less than an hour? Think again. If that 18 miles is from State Street to the West Valley-Kearns-Taylorsville area, and the hour is any weekday from 4-6:30 p.m., you haven’t got a chance. Before we get into bitching about the average 9 mph the trip will take once stop lights are factored in, let’s look at the problem—which is a little like a flash flood. A flash flood starts with a bit of rain on a mountain. The moisture at the top of the mountain flows into rivulets, and now there’s more water hitting those lower flow channels than just the stuff from the sprinkle. All this water flows lower and lower, until much of the rain hitting the mountain is funneled into a few narrow streams. By this time, it’s a lot of water and a lot of pressure. The collected water hits the bottom of the mountain like a tidal wave. To decipher this analogy, think of the mountain as the sum total of all the new subdivisions that have been built on the west side in the last decade, further and further out. Each subdivision adds a few hundred more cars to the rivulets of streets and freeways. Eventually, just as mountain channels fill with collected rainwater, roadways fill with vehicles. The more vehicles, the slower you go. Even now, developers are still building subdivisions that will fill the grid with even more vehicles, but meanwhile, how can you get out of the main rivulets and find a faster channel to your destination? Here are some solutions for the afternoon drive. In this quest, timing is everything. 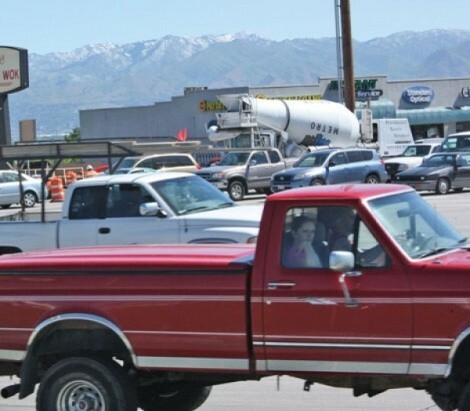 Rush hour now starts at about 4 p.m., and the cross-town highways—like Bangerter or Interstate 215—don’t get very crowded until about 5 p.m. (4:30 on Friday). After that, forget heading west on those roads until rush hour ends. The loooong lights on Bangerter make it a mini-gridlock. From 5 to 6 p.m., you’re better off using regular streets to get home. This is where common sense comes in. You want wide streets with short traffic lights. But forget the main roads, like 3500 South and 5400 South. The two-minute lights at main intersections can add more than a quarter hour to your trip. You’ll sometimes spend 10 minutes just trying to get through the intersection of 5400 and Redwood Road, especially with the roadwork now going on. Here’s another tip: Avoid, at all costs, taking 6200 South west from Redwood. It’s only three miles to Bangerter, but that three miles can take half an hour during rush hour. The road is a two-lane highway for part of the way, and there are many, many lights. In fact, though this is an ecological no-no, it’s best to go, for analogy’s sake, “higher up the mountain.” Go south on State Street to 7800 South, and take it west. Most of the traffic winnows down after 70th South. From that point, you’ll have clear sailing along Redwood or Bangerter, with none of the packed traffic that requires a two- or three-light cycle wait at big intersections. In a timed experiment done at 5:30 p.m., taking 7800 South to Bangerter and backtracking to the 54th Street exit was exactly 22 minutes faster than taking Bangerter all the way from State Road 201, or the 21st South freeway. And, to be quite blunt, there’s just no sense in riding a bike during rush hour. You’re at risk from drivers irritated and tired after a day’s work, and you’ll be breathing the fumes of burning gasoline that will damage your lungs more than a pack of cigarettes. I’m a fanatical environmentalist, yet I would never ride my bike—or even walk my dogs—during rush hour. Even with public transportation, you still have to get from the train or bus to your home.